Synopsis: Famed social psychologist Stanley Milgram, in 1961 conducted a series of radical behavior experiments that tested ordinary humans willingness to obey authority. The subject of Experimenter, the new film from writer/director Michael Almereyda (Cymbeline), is psychologist Stanley Milgram (played in the film by Peter Sarsgaard from Black Mass), a researcher at Yale University in the early sixties who devises an experiment where one test subject quizes another on a series of word associations, and the tester is told to administer a painful shock to the other participant each time they get an answer wrong. The tester is told that the experiment is about memory retention under stressful situations, but here’s the kicker; the person being quizzed is part of the research team, and the experiment is actually about conformity. The only test subject is the person giving the shocks, and the objective of the study is to test their willingness to follow orders and comply with authority, even when their actions result in pain and discomfort to another individual. 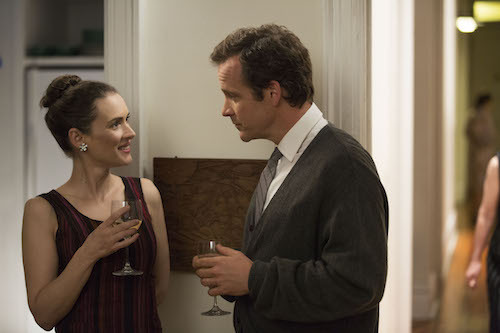 Essentially, Experimenter follows Stanley Milgram’s life and work, spending most of its running time concentrating on the authority and conformity experiments, but also delving into a few of Milgram’s other bright ideas, such as his “Lost Letter Experiment,” where he places fake letters, fully addressed and postage paid, around different neighborhoods and keeps track of which ones actually get mailed, and his “Small World Phenomenon Experiment,” in which he asks random people to hand a folder off to someone whom they know in an attempt to get it to a specific complete stranger in another part of the country, thereby illustrating a “six degrees of separation” kind of thing in America. There’s not a ton of conflict or drama in Experimenter, but it’s fascinating to watch nonetheless, if only to see how the mind of the mad scientist works. Experimenter is a tricky movie to pin down. It’s not really a comedy, but it takes a playful, lighthearted approach to the subject matter, seeming to find the fun and games in Milgram’s experiments. At times, it feels like a high school psychology class filmstrip, with a bunch of matter-of-fact statements and by-the-numbers regurgitations of findings, but that doesn’t stop it from having its entertaining moments. In the film’s most memorable scene, Stanley’s reputation for misinforming his test subjects leads to a communal sense of disbelief when he interrupts a college lecture to announce the assassination of President Kennedy; the students don’t trust him, thinking that he is pulling some “War of the Worlds” type of an experiment on them. So, the movie is not just about Stanley; it’s also about the people around him who are affected by him and his misleading ways. Experimenter is a fun movie. It’s full of just enough techo-babble to sound authentic, but it’s got plenty of heart and soul to keep it real as well. It’s a unique movie, and that’s meant in the best possible way. Experimenter is enjoyable, entertaining, and, dare I say, even a bit educational. The unquestioned lead in Experimenter is Peter Sarsgaard as Stanley Milgram, and he owns it, acting not only as a leading man, but as the host to the party and the tour guide for the journey. The supporting cast that surrounds Sarsgaard in the film is impressive as well. Winona Ryder (Girl, Interrupted) plays Stanley’s girlfriend/fiancé/wife Sasha Menkin Milgram (the film covers quite a few years of his life), and she is nondescript, but serviceable. Stanley’s team of colleagues, an ensemble which includes Jim Gaffigan (“The Jim Gaffigan Show”), John Palladino (Death in the Desert), and Edoardo Ballerini (Romeo Must Die), is hilariously on-point. The subjects of the experiments, which are basically walk-on parts, are played by some fairly big-names as well; Anthony Edwards (“ER”), Taryn Manning (“Orange is the New Black”), Anton Yelchin (The Beaver, Star Trek Into Darkness), and John Leguizamo (John Wick) are all included in the blink-and-you’ll-miss-them roles. In a weirdly meta section of the film, Sarsgaard is shown talking with Kellen Lutz from the Twilight movies, who plays William Shatner playing Milgram in a 1976 TV movie that was made about Milgram’s study called The Tenth Level (which also stars Dennis Haysbert from “24” as Ossie Davis – meaning, Experimenter stars Haysbert as Davis in The Tenth Level – does your head hurt yet?). Experimenter features a ton of recognizable actors in seemingly insignificant roles; even in its casting, the film keeps things interesting. Michael Almereyda makes some brilliant directorial decisions while telling Stanley Milgram’s story in Experimenter. Much of the narrative plays out in traditional cinematic fashion, but very once in a while – actually, more often than once in a while – Stanley will break the fourth wall Woody Allen-style and address the audience directly, explaining what he is doing and the reasoning behind it. Almereyda is actually an accomplished documentary filmmaker, with movies like This So-Called Disaster: Sam Shepard Directs the Late Henry Moss and William Eggleston in the Real World on his resume, and his shooting style coupled with the direct address of the lead character gives the movie a documentary vibe. That does not mean that Experimenter is a dry and stodgy movie; Almereyda tosses in plenty of wacky stuff, constantly adding more and more surreal images to keep the film looking whimsical. The movie is purposefully full of hilariously bad rear-projection, giving many of the scenes a silly retro-grindhouse look. At one point, a symbolic-yet-random elephant wanders right into the film’s frame. By the end of the film, Stanley actually breaks into song. Michael Almereyda’s far-out direction helps Experimenter walk the line between fact and farce, keeping a potentially boring movie about psychology from ever becoming monotonous or dull.